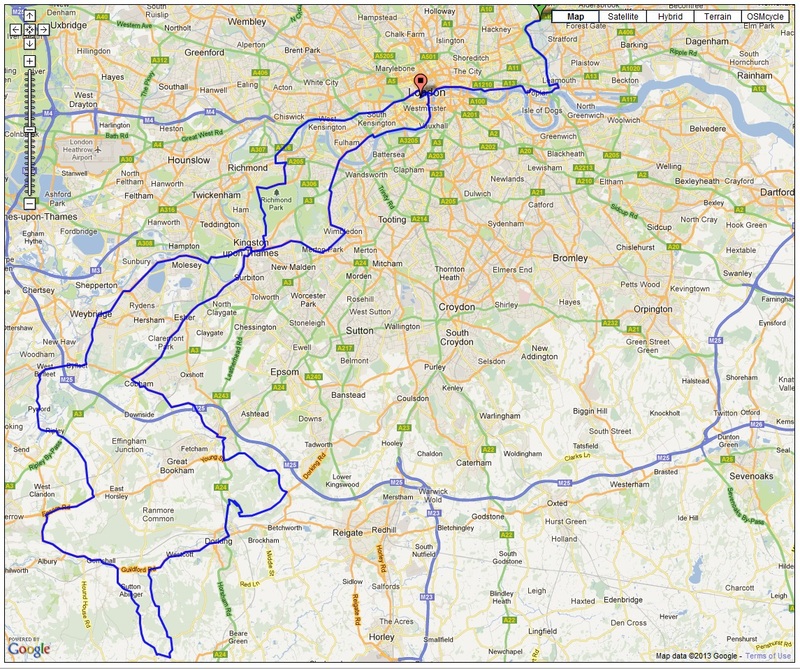 In this post we’ll take a detailed look at the route of the RideLondon-Surrey 100, which takes place on Sunday 4th August 2013. From my previous posts (such as this one and this one), you’ll know that I’ll be participating. A route map for the ride was published earlier this month. 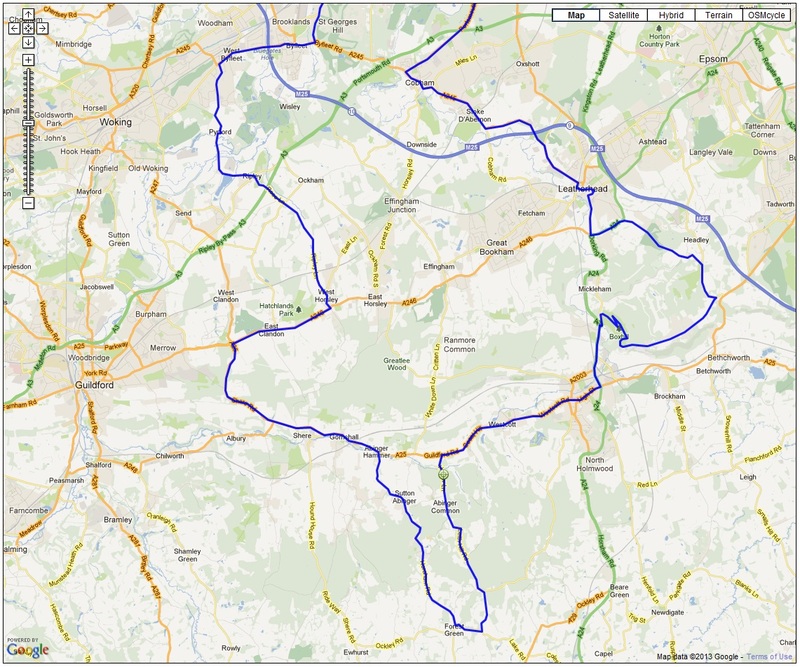 Using that, I’ve plotted the course using bikehike.co.uk. 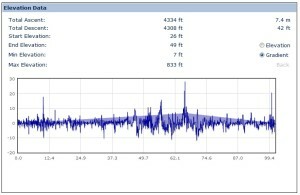 I’ve included some screen grabs, including various sections of the course as well as elevation and gradient charts. If people are interested (let me know in the comments box below), I will attempt to upload the TCX file to the site, which you should then be able to download and manipulate as you see fit. Given the low level of detail on the official map, I’ve had to guesstimate exactly which roads the route will follow. For the most part, this is fairly easy. The route will have to follow main roads to accommodate the 20,000 cyclists that will participate. Similarly, where the professional race shares the same course, it will have to be sufficiently wide to ensure the safety of riders travelling at 40-50km/h. DISCLAIMER: I am SURE that my route will have the odd difference with the final route. If you are going to ride the route using a cycle computer loaded with my route, bear in mind that you will be riding on open roads. Knowing that the event is to be held on closed roads, I took the liberty of assuming that you might not have to ride around all of the Kingston one way system (for instance). As the name of the ride suggests, the total length is 100 miles (just under 161 km). My plotted route calculates it to be a smidgen over, but I doubt you’ll be arguing as you sprint finish down the Mall. According to Google elevation data, the course features 4,325 feet of climbing (1,318 metres). This is largely to be found in the stretch between Pyrford and the summit of Leith Hill and the Box Hill. The highest gradient is approximately 28%, which occurs on the ascent of Box Hill. For the most part though, the gradient stays in the low single figures. UPDATE: As a number of people have commented below, this 28% spike on Box Hill is a Google Maps blip. Consensus opinion is that Leith Hill is considerably tougher than Box Hill (gulp). I should probably mention that I don’t think that the two gradient spikes towards the beginning (mile 10) and at the end (mile 100) of the route actually exist. I have a feeling they are an anomaly caused by roads being crossed by other roads at a higher level (i.e. the roads that cross London bridges). The route follows the Embankment, which follows the river (which is largely flat…). The map on the Ride London website simply shows a big circle at the Olympic Park, with no detail on where in the park it will begin. Looking at how the route begins (westbound, followed by a dog leg turn south) and considering there will need to be space 20,000 cyclists to start safely, I would guess that the start will be at the north of the Olympic Park, where it is bounded by the A12. This is also the location of the Olympic velodrome, providing a nice backdrop for the departing participants. A large part of the RideLondon route is made up of relatively flat roads. In Central London, most of the roads are wide with multiple lanes. Through south west London and out into Surrey, the roads are mainly A roads. Most appear to be wide single carriageways. These wide roads should allow for pretty comfortable riding, even with the large number of cyclists on the road. All the roads will be closed to other traffic for the event, which, for those used to commuting in London, will provide some novelty value at least. The buildings in central and suburban London will provide shelter from wind. The flat roads, shelter from buildings and the drafting effect from all the cyclists on the road, should hopefully make these sections quite rapid, putting time into the bank that riders like me might need to spend on the climbs. There are two significant climbs, and three smaller ones, in the entire 100 mile route. These all occur in the loop through the Surrey countryside. I am certainly in no position to show the hills any disrespect, but we are not talking about the volume or severity of climbing that you would see in continental European sportives (l’Etape, La Marmotte) or, indeed, some of the more serious UK ones (Etape Pennines, Dragon Ride). So what do the two main climbs look like? I’ll take them in reverse order, since I have actually ridden up Box Hill. The climb up Box Hill will be familiar to most road cyclists in the south east and to anyone that saw the 2012 Olympic road races (which just about covers everyone). The road was resurfaced just before the Olympics, reducing rolling resistance and removing those annoying potholes that put you off your climbing rhythm. The tarmac is covered with messages for the Olympic cyclists, offering some distraction as you climb (I seem to recall an entertaining image of Cav on a rocket?). With its switchback turns, Box Hill is the closest that the south east has to an Alpine-style climb. Only a lot shorter. With a National Trust tea shop at the top. The main challenge on the narrow road going up Box Hill is likely to be other people. For those that have done the London-to-Brighton, the challenge of Ditchling Beacon near to the end isn’t so much the gradient but the fact you have to navigate past what feels like some mass sit-down protest spread all across the road. There is nothing like having to attempt a track start on a 15% gradient in order to avoid someone that has stopped without warning in front of you. I assume the 100 mile distance (and therefore fewer ‘chancers’ riding on no training), plus the fact that Box Hill is still some way from the finish, will mean a fewer number of walkers. 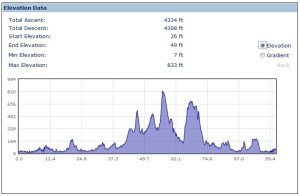 Of course, having written all that, it is now highly likely that I will find myself walking up Box Hill on the day. I have not ridden up Leith Hill, so have less to say. (Note: I have now, and I have this to say about it). If anyone reading is familiar with this climb and has any particular advice, then please do share it via the comments section below. What I can see, having mapped it and taken a quick look on Google Streetmap, is that it looks like a very English climb. That is, a straight road going directly up the hill. 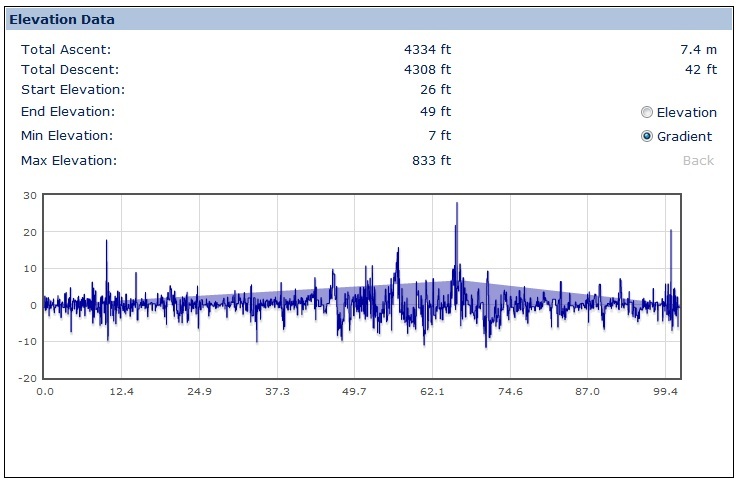 Whilst it doesn’t have the gradient peaks seen on Box Hill, tThe average gradient is higher than Box Hill – (it is 1.1 miles shorter but only 44 feet less climbing). Being straight and a relatively main road means that the presence of other cyclists should be a help (in the form of reducing wind resistance) rather than an obstruction. It could well turn out to be one long grind (which of course you might like). It is worth noting though that the Classic route (the professional race that follows after the sportive) does three loops of the section that contains Leith Hill. It doesn’t do any loops around Box Hill (as the Olympic road races did). As well as upping the length of the professional race, I assume the organisers deem the Leith Hill section to be sufficiently severe to provide some sort of ‘selection’ in that race. Having cycled back through south west London, via Kingston and Wimbledon, the route crosses the river at Putney for the final run in to the finish. This should not be too arduous (relatively speaking). It’s all very flat. There are likely to be cheering spectators (he says, hopefully). Providing you’re in a peloton of sorts then you’ll be getting protection from any wind. All that is left to do is to compose yourself, zip up your jersey, hands above your head and show your sponsor’s logo to the TV cameras. Or is it just me that still imagines myself sprinting on the Champs Elysees…? Having spent some time looking at the RideLondon route, I’d say that, other than the loop out into Surrey, the course is somewhat uninspiring. It features quite a lot of suburban London. Many will already have cycled past the famous landmarks on the route. It doesn’t have any really challenging climbs. But then it isn’t really about the route. The excitement of RideLondon will come from the presence of 19,999 other cyclists, the atmosphere along the way and the fact that the event will be held on closed roads. For me (and I imagine many others), cycling 100 miles is not something to be taken lightly, whatever the route. Studying the course and anticipating what it will require will maximise my enjoyment of the event and hopefully avoid any emotional breakdowns on the day. If you are also doing the RideLondon event, I hope that my musings may be useful. Let me know what you think in the comments below. I will be doing further posts on preparation for the RideLondon event, so please sign up to get the Sportive Cyclist by email to make sure you don’t miss anything (plus, you’ll get access to my (digital!) 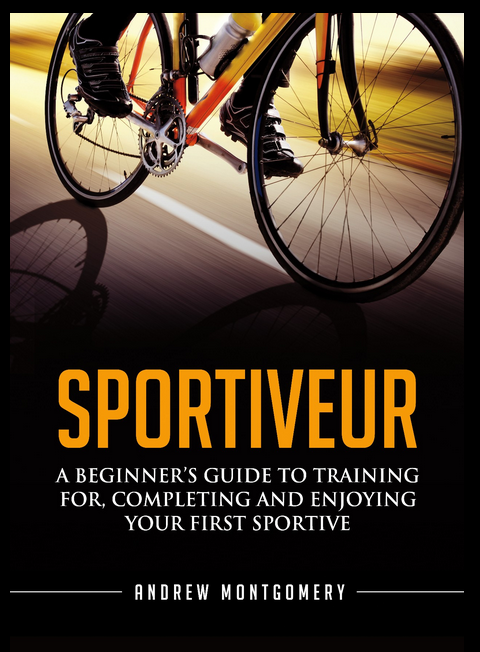 Sportive Cyclists Toolbox, including free ebooks and the like). 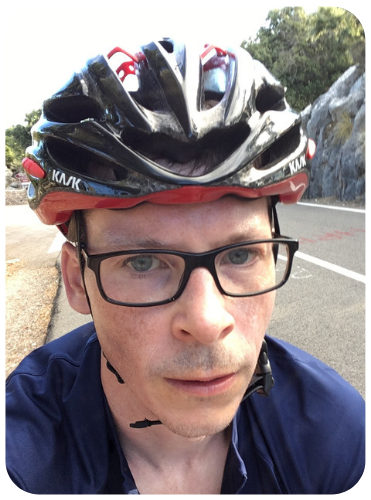 UPDATE: As mentioned above, since writing this post (and actually taking part in the event), I’ve written loads about RideLondon, the climbs, what to wear, carry and eat. The best thing would be for you to take a look at this post, The Ultimate Guide to RideLondon, which will direct you to all the information you need to maximise your performance and enjoyment on the day. Wes Fallan liked this on Facebook. @GrimpeurHeureux thanks for the guide. Really looking forward to this. Leith Hill is considerably harder than Box Hill – which does have anything like the 28% gradient states above. In fact, I doubt it’s even double figures on the hairpins. Living in SW London/Surrey borders this ride is my home patch. The route is very flat into Surrey, a short shallow climb onto Richmond Park and then a long flat run into Weybridge where it climbs again before droping to the Wey Valley. Here climbing starts as we run into the North Downs starts, rolling countryside is the best way to describe it. Leith Hill is lacks the iconic status of Box Hill but is tougher, it seems longer with plenty of false tops, I suspect the total assent may be higher than Box Hill because of this. The drop from Box Hill is fast and the some of the roads narrow, so watch out there. Back through Esher and it is rolling countryside once again before hitting the long fast flats of Thames Ditton to Wimbledon. The climb up to Wimbledon Common is short and painful at 85-90 miles but then its long drop to the river and fast and flat to the finish. Thanks Big Dai. Really helpful to have that local insight. I’ll try to remember the comment about Leith Hill’s false tops on the day. Good post! I think it will be a fast ride, there isn’t really that much climbing. Leith Hill is a long straight drag, with several changes of gradient. Its quite steep in parts and the surface isn’t the best. It can also be slick when there has been recent rain as the trees either side of the road block most sunlight. Box Hill is easier in comparison – even though its longer, it will probably be quicker for most people. No way it hits 28% – half that at most. Hopefully I’ll see you at some point on the day (if not before) – managed to get a ballot place so looking forward to what will be my first sportive in 18 months! Hi Mat, how did you get here? That 28% thing was a bit of a gaff – at least it got the discussion going (so maybe it was deliberate… – it wasn’t). Given that you’re a semi-pro (I’ve seen your Col de Fontaine time on strava), I refuse to take you seriously in a sportive. Disappointed by quite how big a distinction people are making between Box Hill (consensus: easy) and Leith Hill…. See you soon! Hi Grimpeur, Leith Hill is definitely harder than Box Hill but it’s still not that bad, and this is coming from someone who somewhat dislikes climbing. Box Hill will be over in about 10 mins so just need to get your head down and spin it out – I would recommend the “standing climb” drill that we did for Marmotte training if anyone fancies some lactic burn! Box Hill is 7%, if that, according to my Garmin. The main issue with Leith is twofold. One, its longer, and so clearly the scope for getting tired is higher, and secondly it has a slightly demoralising false summit so be prepared for that. Having said that it is still probably max low double digits at the worst point and will be over in less than 20 odd minutes so just grind it out and as you rightfully say be grateful it’s not the 2+ hour, steeper, European version, or indeed either Winterfold or White Down Hill which are both just round the corner and absolutely horrific (24%, no glitches in the data). Then just celebrate the worst part being over. The very top is quite punchy but its only about a 50m stretch and once you are done you have a massive long descent through (I think) Abinger Common. I’m jealous, any more charity places available? Much as I’d like to John, if I am to retain my dignity I’d prefer to remember your hapless performance with clip less pedals on the commute back to Clapham rather than the Marmotte conqueror you’ve now become. Let me get my fitness up and get back to you. Ha ha – I’m going to do the honourable thing and blame the kit, ever since I changed my cleats that never happened again!! I’m not sure about the distances above on Leith, not sure where the start and end is being measured from but it definitely contains some ups, downs and plateaus which make the whole thing longer than box hill, which just feels like a more discrete single ascent. Reyleon Pineda liked this on Facebook. Nick Carr liked this on Facebook. Dil To Pagal Hai liked this on Facebook. Bernard Mullaney liked this on Facebook. Saajan Deep liked this on Facebook. Rhys Rolfe liked this on Facebook. Andrew Corky McAuley liked this on Facebook. Lucy Collett Gilly liked this on Facebook. Ryan Nash liked this on Facebook. Cara Annett liked this on Facebook. Shakir Ali liked this on Facebook. Paul Christopher Robert Johnson liked this on Facebook. Muhammad Farhan liked this on Facebook. Ron Gordon liked this on Facebook. Mustansar Ali liked this on Facebook. Maggie Gatza liked this on Facebook. Riccardo Bozzini liked this on Facebook. Dave Banthorpe liked this on Facebook. Luk Woj Skat liked this on Facebook. Dudley White liked this on Facebook. Caroline Martini-Deacon liked this on Facebook. Fernando Matos liked this on Facebook. James William Marshall Bell liked this on Facebook. Julian Black liked this on Facebook. Liz Irvine liked this on Facebook. Philip Sutton liked this on Facebook. Petronela Buta liked this on Facebook. David Pickler liked this on Facebook. Brian Taylor liked this on Facebook. Your post is great. Given that Im coming from New informationZealand to take part, having some detail on the route (and hills) is really helpful. How did Information get in the middle of New & Zealand? Thanks Ron. I’m pleased you found it useful. Good effort coming all the way from New Zealand for it! Good luck with the training. Guy Walker liked this on Facebook. Philippe Ludivig liked this on Facebook. Simon Dockrell liked this on Facebook. Saif Haque liked this on Facebook. Dominic Ball liked this on Facebook. Richard Allison liked this on Facebook. I tested both Leith and Box Hill yesterday. Whilst I was able to ride up Leith Hill in a 39 x 23 gear, this is the hill on the RL100 which I will treat with some respect as it is certainly going to test anyone with lactic acid in their legs. Box Hill by comparison is easy as I was able to ride the whole hill in a big ring sitting down! hi, I am a 50 something relative newbie cyclist doing my first 100 miler for the London ride. The ride HQ tell me that total ascent will be 1700m. Seems high to me…. as we dont know the area well, rode Leith hill, White Down then Box Hill on Monday. Do you reckon the Leith Hill route is Tanshurst Lane? Road was in a shocking state and not fit for 20k of us. Got a feeling we rode up the wrong hill! Hi Tim, I think the elevation is more like 1300m, but as that is based on Google mapping data, there may be some inaccuracy. As far as I’m aware, an official detailed map of the route has not been released, but using the summary route they put out, I’m pretty sure the route does not go up Tanshurst Lane. I believe the ‘Leith Hill loop’ will go south from Abinger Hammer along the B2126, through Holmbury Saint Mary down to the junction with Ockley Road (so past the turning up Tanshurst Lane). Having travelled half a mile along Ockley Road, you’ll turn left up Etherley Hill, which becomes Abinger Road. You’ll then bear left onto Leith Hill Lane. (This is where Tanshurst Lane comes out, so you’re recce ride probably featured the top part of Leith Hill (assuming you turned left)). The lower part of Etherley Hill/Abinger Road suffers from water flowing down so the road surface isn’t great. You’re right that this is likely to be a pinch point if a lot of people are trying to climb at the same time. I’m sure this will frustrate the fastest cyclists, but for me, the ride will be ‘won or lost’ on the more prevalent flat sections, so being forced to slow or even walk (!) on bits of Leith Hill might be a blessing in disguise. Thanks for this very helpful run down of the course. Coming from Essex I haven’t cycled much of Surrey, so going to try to get out there this weekend to take Box Hill (and now Leith Hill having read the reviews!!) before the big event. Good luck to everyone riding and see you there!! Thanks Elizabeth. Glad you found it useful. Good luck with the remaining training and on the day itself! As stated, could you please upload the TCX of the full route. Would be handy to have to follow on the day re course points, and the Garmin one uploaded is a training one not taking into account closed roads, and the start is way off the actual start. Damon – I’ll take a look. To be honest, my route is always going to be a best guess. I’m sure the organisers will reserve the right to change it, right up until the last minute (in case of emergency road works etc). In terms of accuracy of the training one, I’ve only had a quick look but I think the main issue is the one way system in Kingston (and maybe at one other place). For Kingston, you really won’t need to be following your Garmin. It’s so short, and then you’ll be back on the training route. Good luck! Fantastic insight into the cours. Really looking forward to closed roads. Thanks Keith. Glad it was useful for you. Looking forward to it as well! only just found this page – looking for elevation for Sunday’s ride, I have conquered Leith and Box Hill during training – and am very much a leisure cyclist – so most people will be absolutely fine on them! Thank you. All the best for Sunday! I did my Prudential Ride London 100 recon last Saturday and Leith Hill did come as a shock. Maybe it was because I didn’t know where the top was, but I found it hard. Box Hill was dead easy. Nice rhythm, smooth road, even the speed bumps made no difference. I will certainly be going back to test myself before the day. Great news Michael. And the good thing is, now you know that neither Leith or Box hold any fear for you. You know what’s coming. Good that you’re thinking of doing Leith again. Next time round, just imagine it with loads of people on there – some walking, some slowing, some wobbling. Worth thinking about gears as your going up and where you need to change down to a low (or lowest) gear in case you need to spin ‘quickly’ as you take evasive action around a wobbler.